So, if you follow me on Instagram, then you likely know that I was in Ireland last week - and if you don't, why not? Have a look here! Anyways, I took a few days off work, my first holiday in months, and decided to hop over the water to Ireland for a few days, since I've never actually been before, despite how close it is. I was there for five days, based in Dublin throughout (I would've posted sooner, but then I went to my parents' for a few days, where the wifi is almost non-existent). I went on a few day trips out of the city - more of those to come next week! - and spent three full days exploring the city itself. I had booked early and late flights to maximise my time, and although it, of course, wasn't enough to see absolutely every sight in the city, I felt it was a good amount of time to see what I was most interested in. My flight landed early in the morning, and I quickly caught a bus into the city centre, and dropped my bag off at the hostel, before heading out exploring again. First up, was a free walking tour of Dublin - seeing as I now work as a free tour guide, I thought I should support others! I've never really done these prior to starting my current job, but now I think they're a good way to get a basic understanding of a new city, including its history and its layout. My knowledge of Ireland was pretty limited before this trip, so it was definitely good for me to learn a little more about what I was seeing. It was also a good way to tick off a few sights, some of which I would go back and explore in more depth, and others that I just admired from outside, since it would be impossible to go into them all. We started in the ancient end of the city, with Dublin Castle, and Christchurch Cathedral. 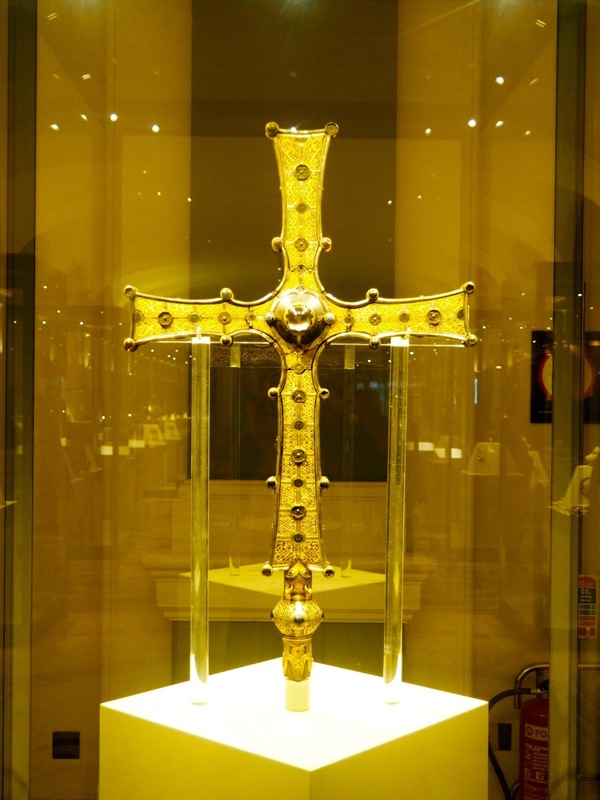 The Castle was an important location during the time of British rule over Ireland, and of course, the cathedral is hugely significant in a largely Catholic country, as well as being one of the oldest buildings in the city. This is also where the old city walls used to be, and the buildings beyond are the 'liberties', named for being free from the rule of the city when they were first built. We wandered through Temple Bar - which is a whole area, as well as the name of one of the pubs here! - and learned a little more about it, as well as stopping for a break in one of the pubs. As well as history, the guide was also sharing some unique local stories, such as the legend of Darkey Kelly. After the break, we walked along the River Liffey, crossing the Ha'penny Bridge, named for the old toll to cross it, then crossed back over further up at O'Connell Bridge. The tour took about two and a half hours, and finished up outside Trinity College, leaving us free to head into the campus to explore more ourselves - I saved that for another day! The tour was largely confined to the south side, as that seems to be where the main historic sights are, and was where I ended up spending most of my time in the city. The guide had studied history and was clearly very knowledgeable about the city, but I would have liked a little more humour and energy from him - I can't really fault him, I'm probably being picky, as a guide myself! I stopped off for a coffee after, then headed back to the same meeting point to do a second tour with the same company, this time focussing on Fables & Folklore. This tour was the main reason I picked this company (Generation Tours). I wouldn't necessarily always do multiple tours in each city I think, but folklore is an area of particular interest of mine, so I was eager to hear the local stories. Some were tales I'd heard or read before, particularly the early mythological stories, but there were also more recent local characters thrown in as well. The route was also entirely different, visiting St Patrick's Cathedral, Dame Street, and finishing in St Stephen's Green, amongst others. It ran over time a bit, lasting two hours, rather than one and a half, but I didn't mind, as I found it all very interesting! Folklore might not be to everyone's tastes, but the stories are quite entertaining in most cases! I was pretty tired after the back to back tours, so by now I was able to go check into the hostel and unwind for a little bit. 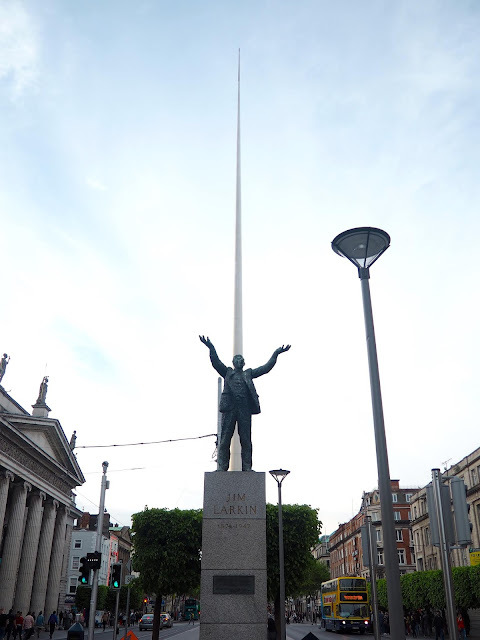 I went back out later, in search of food, and wandered over to the north side, up O'Connell Street, where there are plenty of statues, the stunning General Post Office, and of course, The Spire, the massive needle shaped structure dominating the skyline. I walked back through Temple Bar again, as I was staying nearby anyway. I don't really go out when I'm travelling alone, as I was, but it was Saturday night, so I wanted a quick glimpse at what the area was like then - full of drunk tourists, as to be expected! It was grey and rainy on my second full day, so I decided to go with the museums and indoor activities this time! 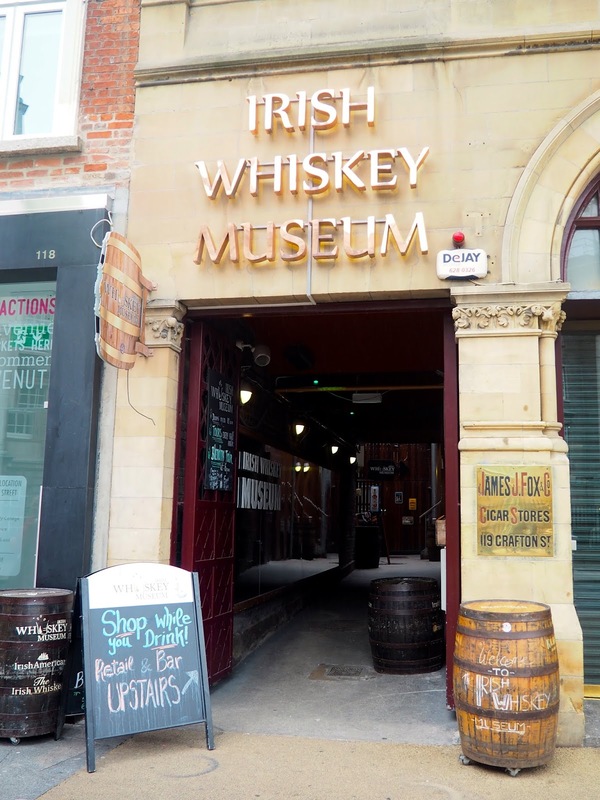 Initially I'd planned to start in the National Museum, then the Little Museum of Dublin (which is recommended to book in advance, so I already had a set time slot), and finally the Irish Whiskey Museum, but it turned out the National Museum is closed on Sunday mornings, so I would be kicking off my day with whiskey instead! Obviously there are big, well-known names in Ireland for alcohols - Guinness and Jameson being the top two in Dublin - but I'd been told the Guinness Storehouse was really a museum and bar, best done with friends, and I opted for the Irish Whiskey Museum, as it isn't attached to any specific brand, so I'd get to try various whiskies. I'm a big fan of Scotch whisky, so I wanted to see how the Irish varieties stacked up. It was an interactive sort of tour, with a guide taking us around various displays and talking about the history of Irish whiskey, of how it was first discovered and distilled, and how the process and industry changed over the years. 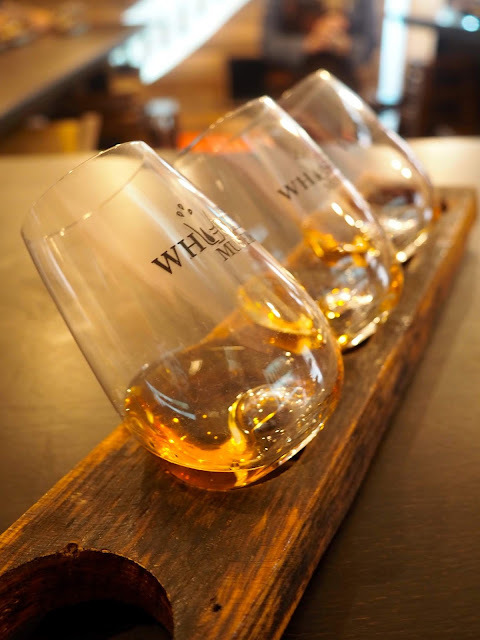 There's a variety of whiskey only made in Ireland, and we learned the difference between Irish and Scotch. At the end, we got to taste three different sorts (you can pay premium for a fourth as well); one which is close to a bourbon; one which is uniquely the Irish variety, potstill; and one which is mostly triple distilled, and closest to a single malt. The third was my favourite, and it's the most similar to Scotch; Irish whiskies tend to be a bit smoother, but are a bit too sweet for my tastes. But three drams in under half an hour at 11.30am left me a touch tipsy, so I had to go get food right after! Then I went to the Little Museum of Dublin, which is usually ranked as one of the best in the city. As the name suggests, it's small, with only a couple of rooms, located inside an old house near St Stephen's Green. 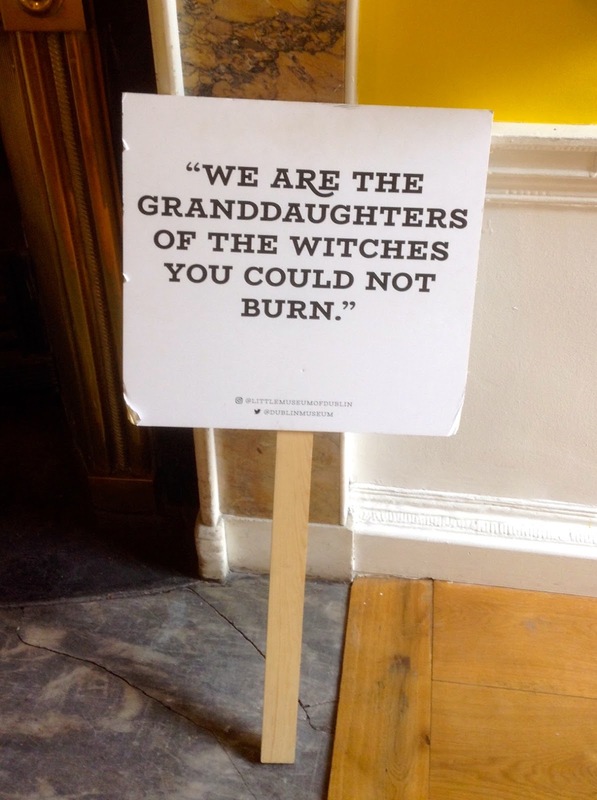 You have to do a guided tour of the main rooms, which I had booked, but while waiting, you can view the temporary exhibition, which was about the women's history of Ireland. The main rooms are full of items donated by the residents of Dublin, telling the story of the city - there aren't many signs with information around the rooms, so that's why there's a guide, explaining what all of it is about, and how the city has changed. Finally, there are a couple more exhibitions on the top floor to explore on your own, featuring the Irish Times, Alfie Byrne, and even U2. 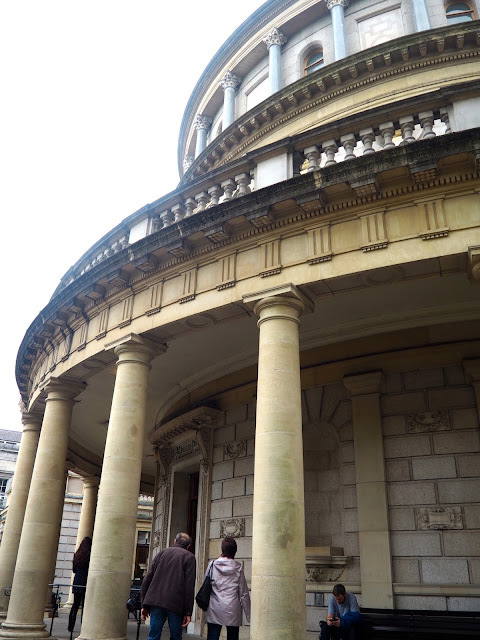 After another coffee break, I finished up with a visit to the National Museum, which actually is spread across multiple buildings, but I went to the Archaeology one, as it is most specific to Ireland. You start with prehistoric times, and move forward through time, exploring remnants of Celtic, Medieval, and Viking Ireland. They had a couple of exhibitions about other parts of the world, including Ancient Egypt, but I skipped those, as I'd already been inside for a couple of hours, and was getting pretty tired. There were a lot of interesting things to see - I'm not a history buff, so I wasn't reading all of it in depth, but I got a general understanding - but one of the most unique exhibits was the remains of people that had been found in bogs, perfectly preserved in the peat. Slightly gruesome, but fascinating as well! My evening was similar to the night before, venturing out for food and a short stroll, before turning in again. My third full day in the city was also my last, so I had to go to the airport that evening. I checked out in the morning and left my bag at the hostel, before venturing out once more. 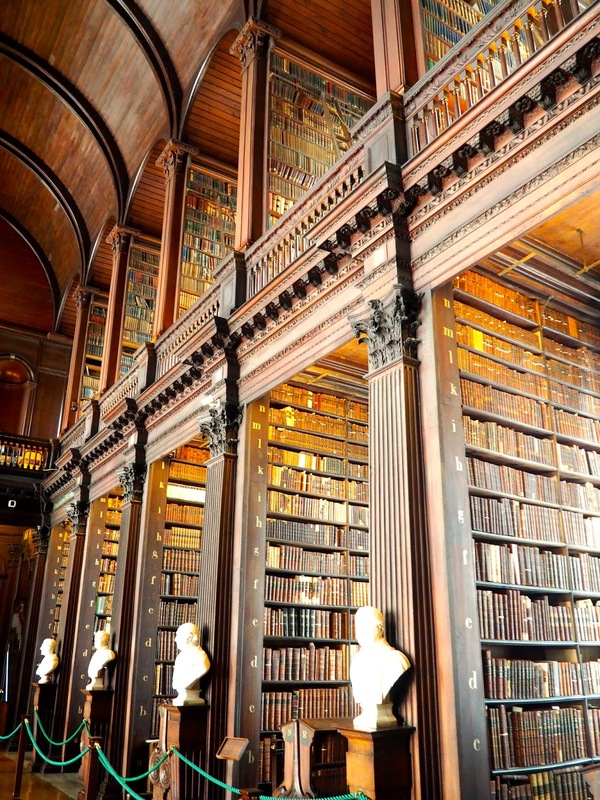 I started by heading back to Trinity College, which I hadn't gone inside at the end of the tour on the first day. 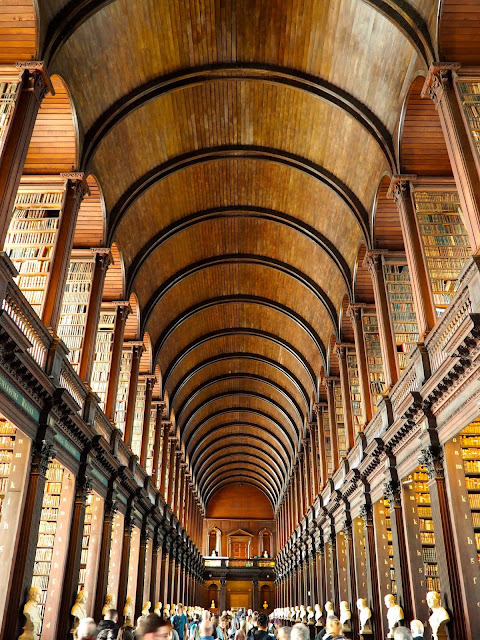 The College is popular with visitors going to see the Book of Kells, but it only costs a couple of euro more to take a guided tour of the campus, led by a current student, so I did that. It's a beautiful campus, with many squares and the green towards the back, and with accommodation on site, several of which were once inhabited by famous alumni. The bell tower is one of the most iconic sights, and superstition says that if it tolls while a student is passing under, they will fail their degree! The tour finished at the entrance to the Book of Kells exhibition, included in the tour ticket. First, there's an exhibition of the history and creation of the book, which was written on the island of Iona, before being transported to Ireland, and dates from around 800AD. You then get to view the book itself (no photography), which is displayed under low lighting, and they change the spreads it's open to regularly. There's always two spreads, one with mainly writing, and the other with more pictures and decoration. 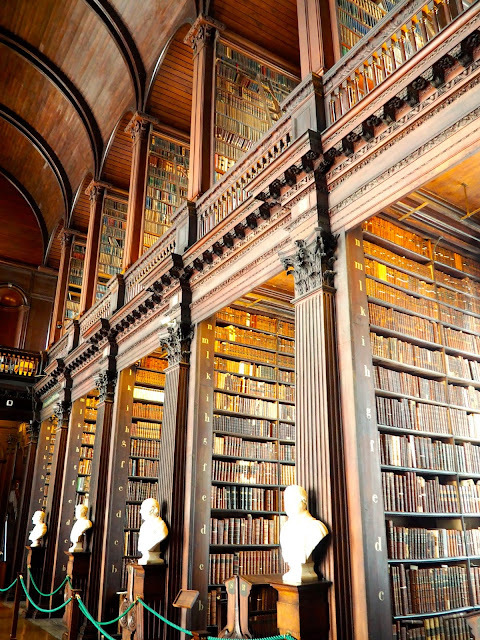 Finally, the visit ends in the Long Room of the Old Library, a stunning room full of books, which was also the inspiration for the Jedi Archives in Star Wars! It was a lovely, sunny day, so I spent the rest of my afternoon exploring the outdoor sights, namely Merrion Square Gardens, followed by St Stephen's Green. On the corner of Merrion Square, there's a building which was once home to the dramatist Oscar Wilde, with a plaque on the outside. The corner of the gardens looking on to the building has a statue of Wilde, and columns with quotations of his inscribed on them. There are a few other statues around the park, including a war memorial, and on such a nice day, it was full of people lounging out on the grass. I only wandered through, not really stopping, as I then stopped for a coffee break on route to St Stephen's Green. 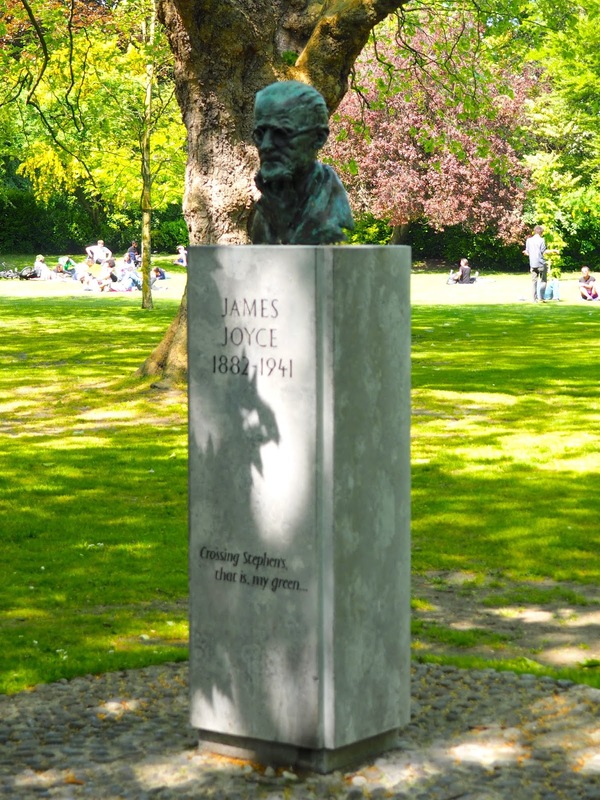 This is a much larger park, at the end of Grafton Street (the main shopping street), and it played a key role during the 1916 Easter Rising, so there are various statues and displays around the park about the people involved. There are also memorials to other notable Irish people, including the writers James Joyce, and W.B. Yeats - Dublin, like Edinburgh, is a UNESCO City of Literature, as many significant writers hailed from the city. There's also a beautiful pond, full of birds, with trees draping into the water. I spent quite a while in the park, lazing in the sun, almost dozing off while listening to music, just enjoying having time to relax while on holiday! Until eventually, I had to pick up my bag, and head back to the airport to return to Edinburgh. I feel like three days was a good amount of time to spend in the city, because unless you plan to go to every single attraction they have, it's plenty of time to get around the ones you want to see, without getting bored. If I was to return one day, there'd still be a few places I could check out, but I enjoyed what I saw during this trip, and certainly don't feel like I was short of time or missed out on anything!